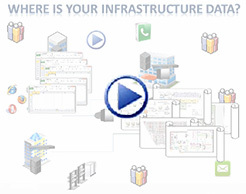 Consolidate data normally spread among multiple applications such as Geospatial Systems, CAD Systems, Visio Drawings, Spreadsheets, Home-grown Databases, etc. Map services to physical assets for a thorough understanding of relationships between Circuits, Equipment, and Connectivity. When was it last maintained? How many services rely on it? These IT network asset questions and countless others can occur on a daily basis within large organizations, and a major key to efficiency is how quickly they can be answered. Cables. Servers. Desktops. Racks. Patch Panels. Circuits. Applications. Discovery Data. Work Orders. The list goes on. A myriad of active and passive IT asset data scattered in multiple forms, both hard copy and soft. Databases, spreadsheets, CAD drawings, and red-lined paper, not to mention what’s stored in your personnel’s heads. Now what if you took all that information and consolidated it in ONE place. into ONE repository so that you can quickly answer all those questions posed on the left, and countless others that come up on a daily basis or during emergencies. Not sure if you really need such an extensive system in place?Here are a few scenarios to consider. NEED SOME HELP getting the right processes in place to manage your Outside Plant Infrastructure? 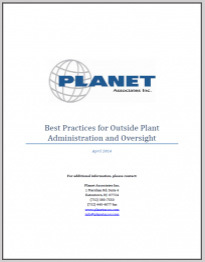 Download our FREE guide to Best Practices for Outside Plant Administration and Oversight.